Hyundai has added additional standard features to its i40 range. 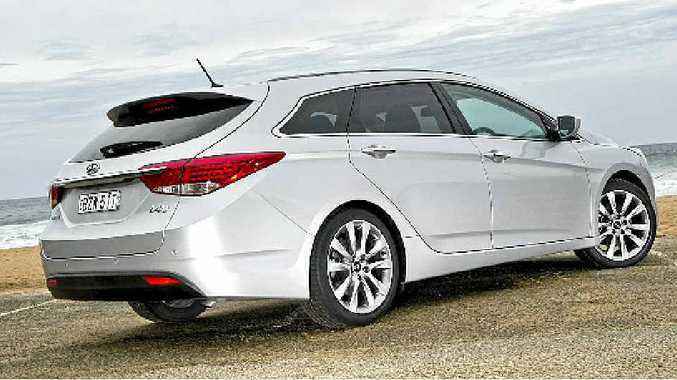 HYUNDAI has upgraded its premium i40 sedan and i40 Tourer models. Available in three trim levels, Active, Elite and Premium, each variant receives additional features with prices to remain the same on most models - but some will rise by $100. All derivatives now come with an eight-sensor front and rear parking system. Tourer models also gain a cargo blind and safety net. The range-topping i40 Tourer Premium now also comes standard with a power tailgate. Hyundai's i40 range has a five-star ANCAP rating with standard features including nine airbags, anti-lock brakes incorporating EBD and BAS, vehicle stability management, electronic stability control, traction control system, emergency stop system and hill-start assist control. The new satellite navigation system on Elite and Premium variants is delivered with a fully integrated rear view camera display, operated via the seven-inch centre fascia mounted full-colour touch-screen. The navigation system incorporates NAVTEQ maps, SUNA live traffic updates, and a comprehensive Point of Interest database. Also included is NAVTEQ MapCare offering up to three years of free mapping updates. The system also manages the audio package which includes four speakers, two tweeters, woofer, external amplifier, and Bluetooth/digital iPod connectivity. Across the i40 range there are two engine options, a 1.7-litre CRDi diesel and a 2.0-litre GDi petrol engine. Both engines are married to either a six-speed automatic transmission with electronic sequential manual mode featuring steering wheel mounted paddle shifters, or a six-speed manual transmission. Metallic/mica paint $595 on Active and Elite models.